New Delhi: August 17, 2016: Konica Minolta is known for its quality and reliability in digital printing technology with world class technological features. Konica Minolta has been able to set a distinctive position in the Production Printing Market in India. Among its versatile product portfolio bizhub PRO 1100 is one such product which outperforms in all business environments. 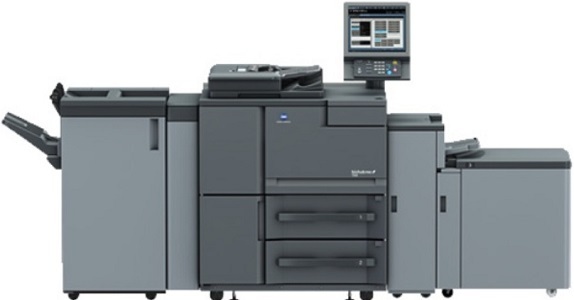 The bizhub PRO 1100 series is a workhorse monochrome digital printing press, ideal for central in-house printing departments, external print-for-pay services, education, government agencies and high volume statements and bills printing. The bizhub PRO 1100 possesses the reliability and precision required of on-demand printing systems. At the same time, its refined operability increases productivity in a variety of applications, from professional use (printing companies) to centralized reprographics departments. Featuring a fast, high-productivity system for a quick turnaround of large jobs, the bizhub PRO 1100 is capable of printing 100 pages per minute (ppm) with high print quality of up to 1,200 dots per inch (dpi). The machine can handle expected average volumes of between 150,000 and 300,000 prints and peaks up to 2.2 million black and white prints per month. This puts the printer at the top tier range of LPPs in the market for an entry level price. In addition, bizhub PRO 1100 comes equipped with a simultaneous double-sided colour scanning technology able to scan up to speeds of 180 opm (originals per minute). The bizhub PRO 1100 is the first production printing device from Konica Minolta to support the bizhub OP (Open Platform) open platform technology. It is a new user-friendly open developer platform that contains an OpenAPI communication system, allowing application developers to create applications that communicate with the bizhub PRO 1100. The platform allows the use of third-party applications for accounting, authentication or scan-routing applications. As an ideal entry product to digital black & white printing, the bizhub PRO 1100 paves the way for new business opportunities. With it, one will accomplish more print jobs in the shop and meet tightest deadlines with ease thus diversifying the business and looking into a bright future. The bizhub PRO 1100 is the key for any business success. Offering complete and dependable productivity, the bizhub PRO 1100 stands for you and your customers’ ease of mind.